My go to snack is usually tortilla chips and salsa or chocolate chips blended with a few raisins to make myself feel better about it, but I’m trying to clean up my act a little bit and try healthier snacks. 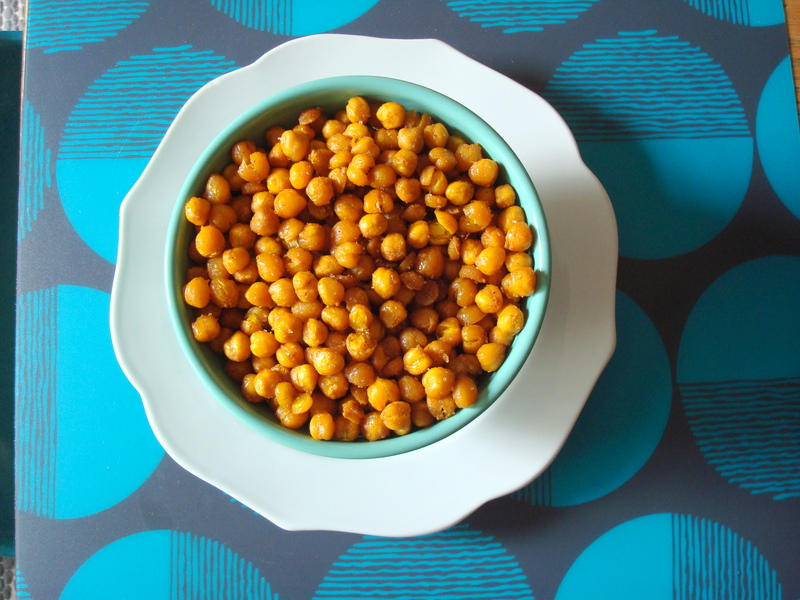 This recipe for crunchy curried chickpeas appealed to me since it involved ingredients I always have on hand and was very quick and easy to make. You start by rubbing the chickpeas (you can either use canned [make sure to rinse them first] or prepare your own from dried form) to get the skins off of them. It doesn’t take very long to do and is almost therapeutic in its monotony. Then you blend the skinless, dried chickpeas with a little olive oil, curry powder, freshly grated ginger, and dried thyme. Simple! Then they get baked in a 400 degree oven for about 40 minutes until crunchy. 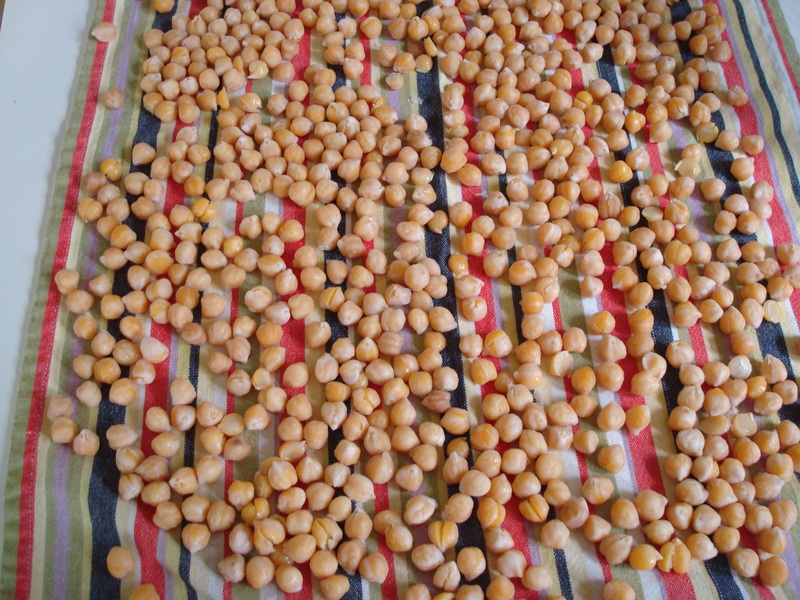 Rinse the chickpeas and drain completely. Lay them on a dish towel and gently rub them to remove any remaining skins, making sure that they are totally dry In a large bowl, stir together the olive oil, curry powder, thyme, and ginger. 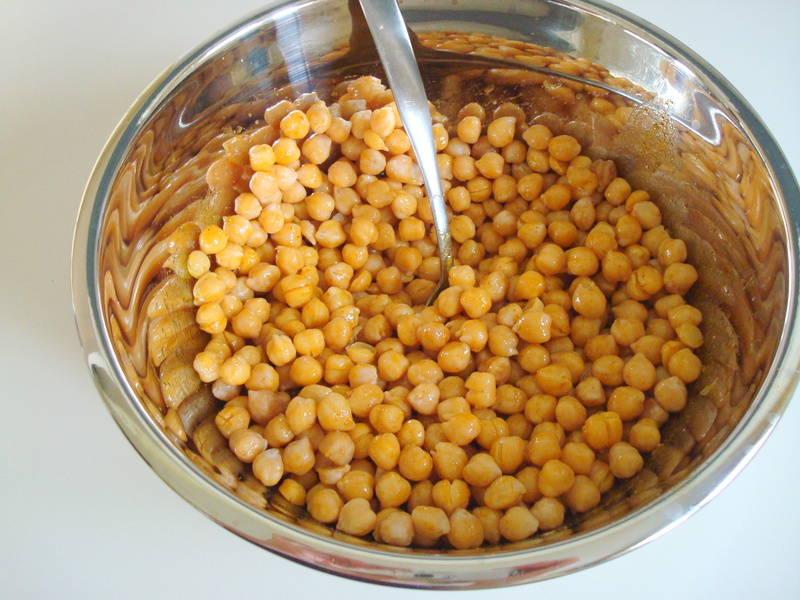 Add the chickpeas to the bowl and toss to coat. Spread the chickpeas on a parchment-lined rimmed baking sheet. 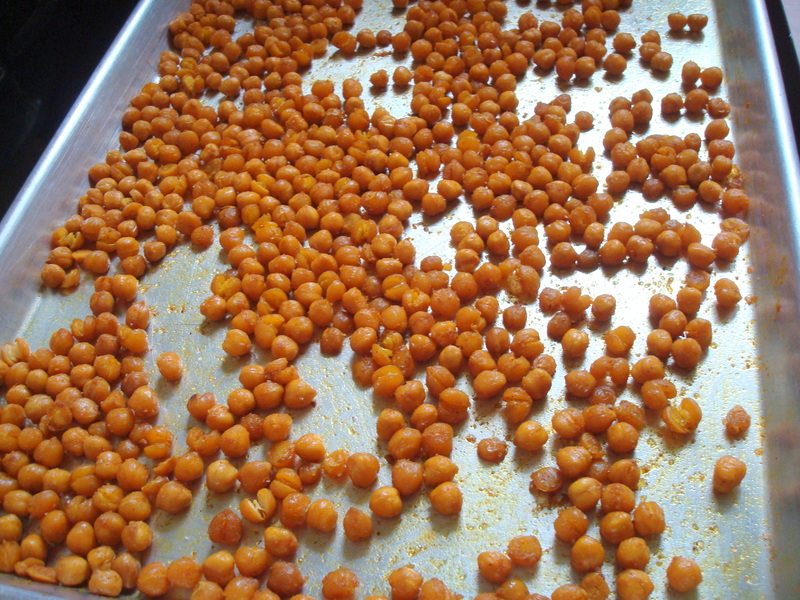 Bake the chickpeas, tossing them occasionally, until they are light brown and crisped, 40 to 45 minutes. As soon as you remove them from the oven, sprinkle with a teaspoon of salt. Taste and add more salt if you like. Let them cool completely (this will make them crunchier), then serve. These are best eaten the day they are made. This stew starts with toasting some fragrant spices on your stove. After they are properly toasted you grind them up in a spice mill/coffee grinder or go old-school with a mortar and pestle and smoosh them to a fine pulp using a little elbow grease. Then you mix those spices with a little olive oil, lemon juice, cayenne pepper, and crushed garlic. This is called Harissa and it will bring a whole lot of flavor to whatever you’ve got going on in your kitchen. 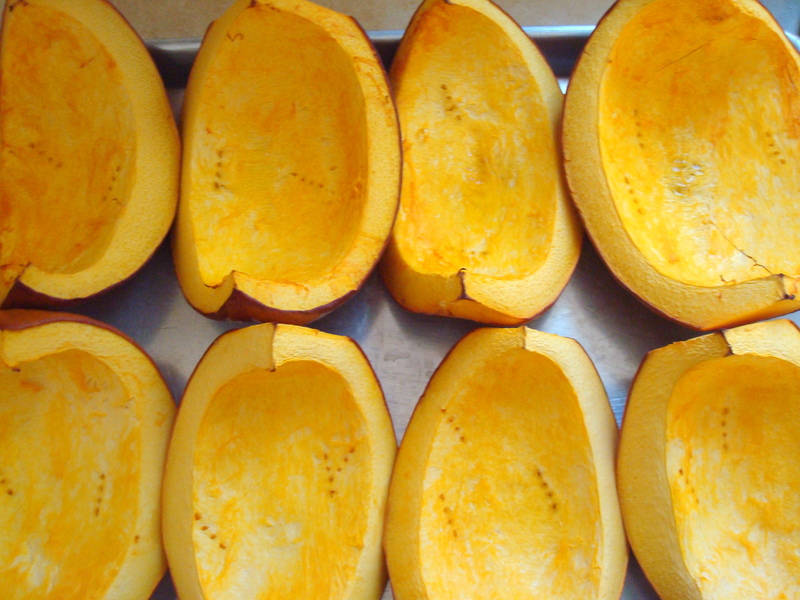 Butternut squash gets peeled and chopped into small pieces and roasted in the oven. There are onions, more garlic, chickpeas, canned tomatoes, carrots and parsley. They all combine together to make a great fall stew that is hearty and comforting and filling and a bit spicy. This is total guilt-free food, as a friend of mine would say. You can eat as much as you like and know that you are putting good stuff (mostly vegetables!) into your body. And better yet, your gluten-free sister and your vegan cousin along your meat-loving uncle can all enjoy it. Together. Preheat oven to 375 degrees. Place squash on a baking sheet lined with parchment. Drizzle with 1 ½ tablespoons olive oil and salt and pepper. Toss well and roast until golden brown, 45 to 50 minutes. In a large skillet or pot, warm remaining 1 ½ tablespoons olive oil over medium-high heat. Add onions and a pinch each of salt and pepper. Cook for 3 to 4 minutes. Stir in garlic and cook for 3 minutes. Stir in parsley stems, cumin, and paprika, and cook for 1 minute. 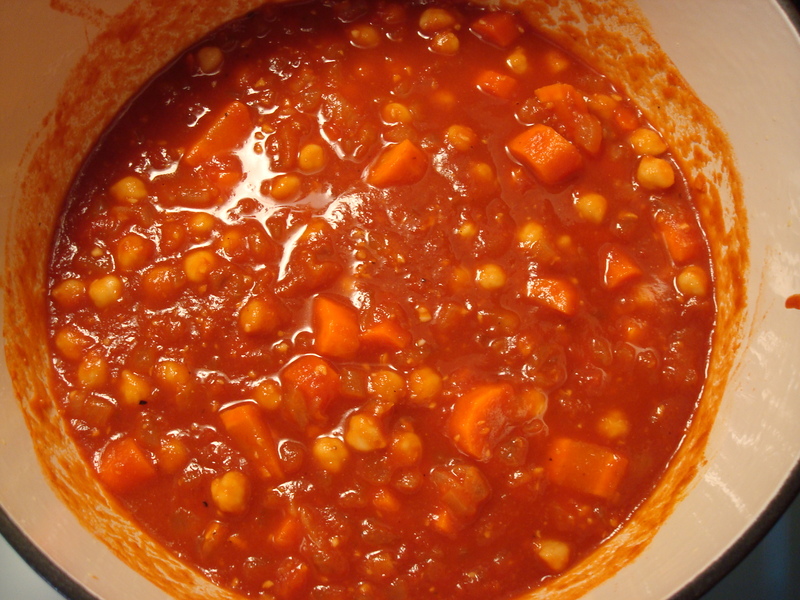 Add carrots and 1 cup chickpea cooking liquid (or water, if using canned chickpeas) to onion mixture. Bring to a boil over high heat. Reduce heat to low and simmer, covered, until carrots are tender, 10 to 12 minutes. 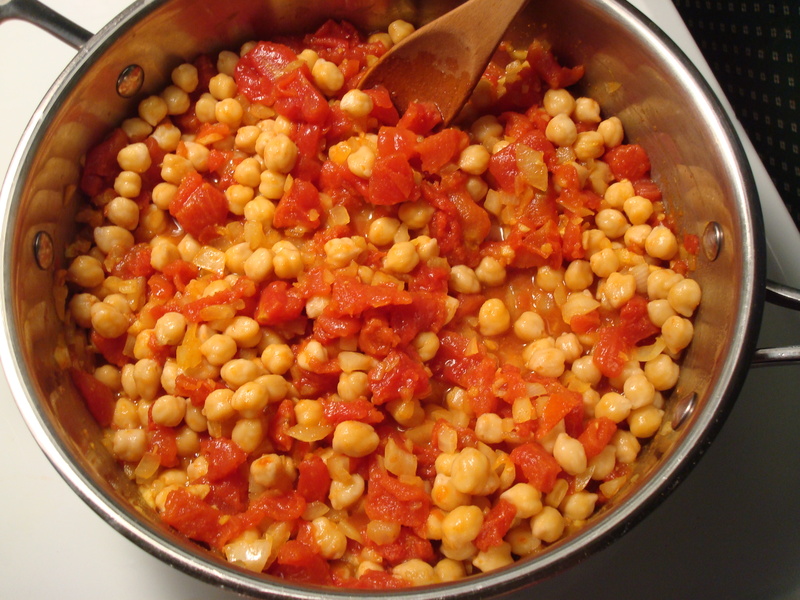 Add tomatoes and chickpeas. Raise heat to medium-high and simmer for 10 minutes. 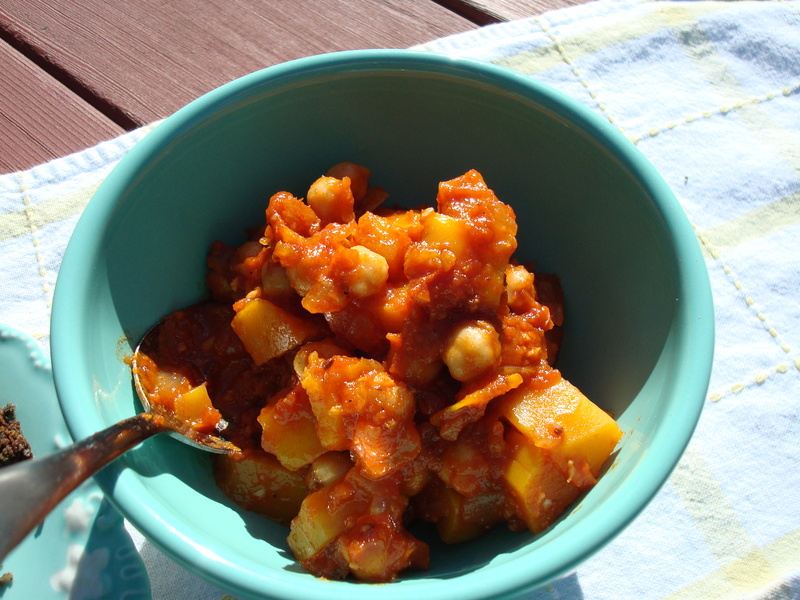 Stir in harissa paste, chopped parsley leaves, roasted squash, and remaining ½ cup chickpea cooking liquid (or water). 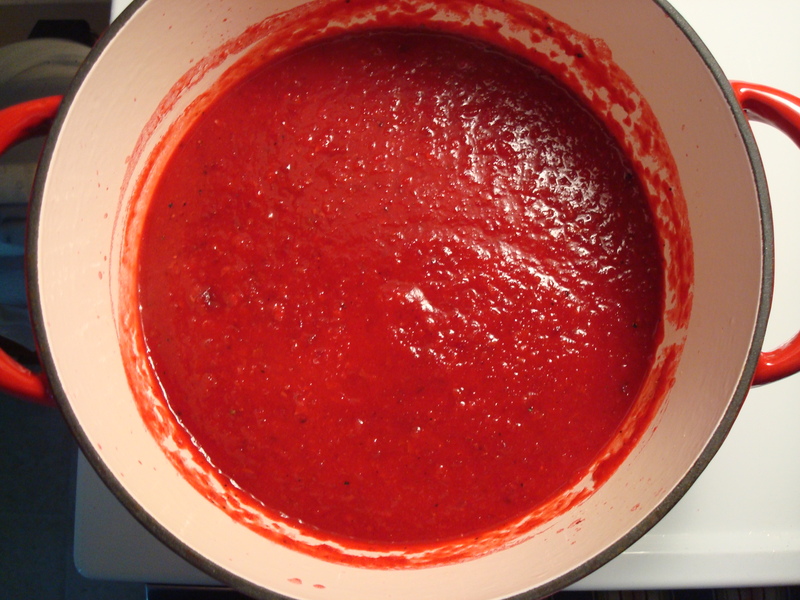 Simmer, uncovered, until flavors meld, another 3 minutes. Season with salt and pepper to taste. Warm a skillet over a medium flame. 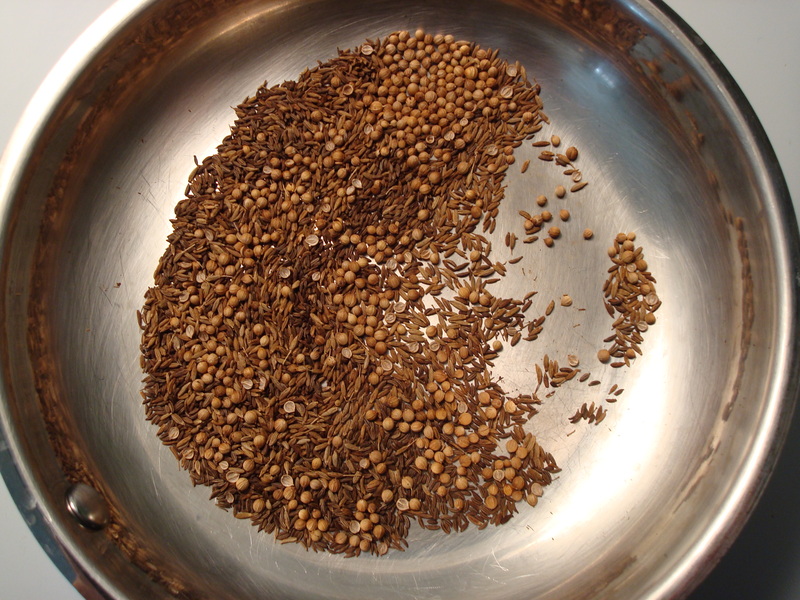 Add cumin, coriander, and caraway seeds. Toast, shaking pan, until seeds are fragrant, about 3 minutes. Grind in a spice grinder until fine. Place ground spices in a bowl, and add cayenne, garlic, lemon juice, and salt. Stir in olive oil until smooth. Cook’s Note: Harissa can be refrigerated in a sealed glass jar for 1 month. This year I’m planning to make Thanksgiving dinner entirely from scratch– no cans, no prepackaged business, just 100% homemade– prepared from raw ingredients, with my own two hands. I know I can do it because last year I pretty much only opened one can (chili peppers to add a kick to corn pudding). I can totally get by without a can opener this year. And since it’s pretty much a requirement that pumpkin make an appearance in at least one form or another during Thanksgiving (or in some cases it appears in multiple forms) I spent a little time this past weekend making my own pumpkin puree. It’s simple! All you need is a little bit of time and a good knife. First you cut off the top of the pumpkin, and then slice it in half down the center. Next you scoop out the seeds (don’t throw them away though! We’re going to need them in a minute.) Then you cut the pumpkin halves in half and place on a baking sheet. Bake in the oven for about 45 minutes (mine were kind of large so it took closer to an hour). Then walk away and go catch up on your magazine reading or DVR shows while it bakes. After the pumpkin has finished baking, let it cool until you can handle it and remove the pumpkin flesh from skin using a knife. Place pumpkin pieces in a food processor or use an immersion blender (regular blender with a little water also works as does a potato ricer or potato masher) and pulse until no large chunks remain. I then bagged it up in one-cup portions in small freezer bags so that I can use it whenever I want throughout the year. Two small pumpkins yields about 8 cups worth. 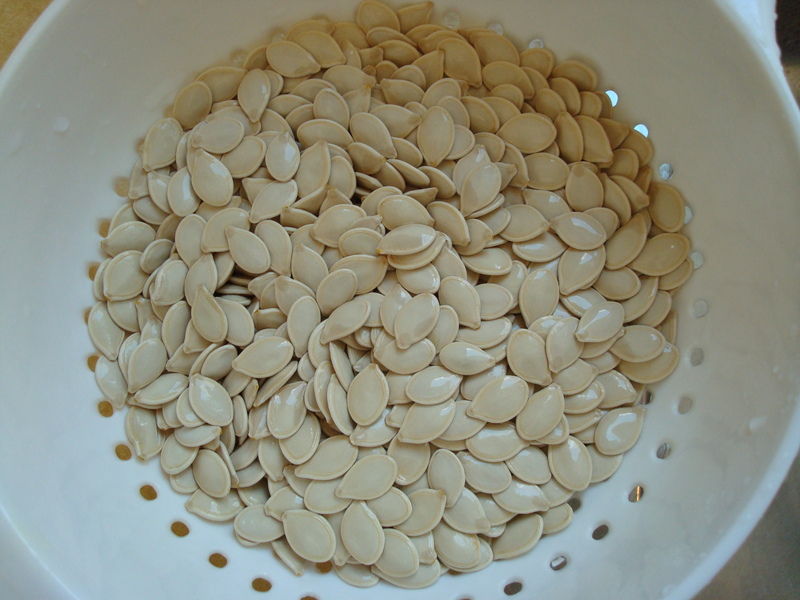 Once the pumpkin seeds are dry, toss with a little olive oil and salt and any seasonings you so desire. (I’m a purist and keep it simple with just the olive oil and sea salt.) Then bake for about an hour until they are a nice toasty-shade of light brown and enjoy. Happy Halloween everyone! 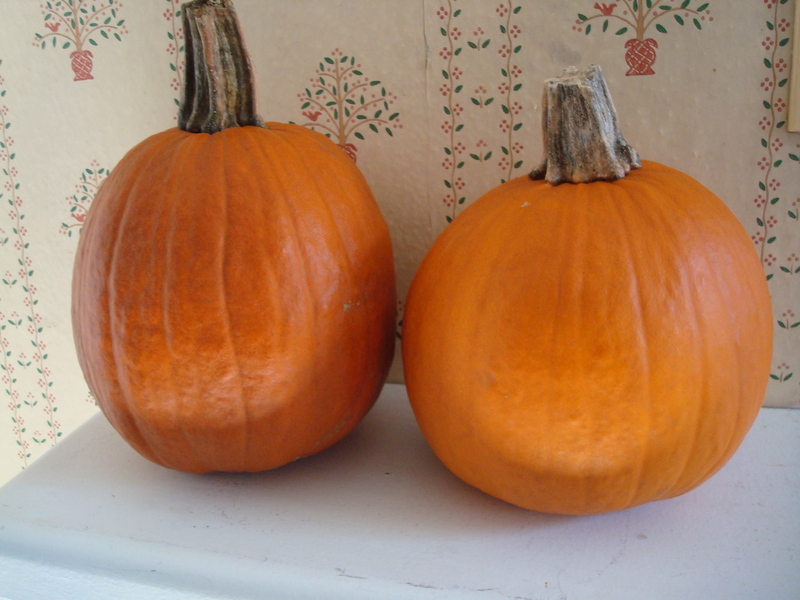 Select a couple of small-ish pumpkins. Cut the pumpkin in half. With a spoon or a scoop, scrape out the seeds and pulp from the center. You don’t have to be too thorough with this. 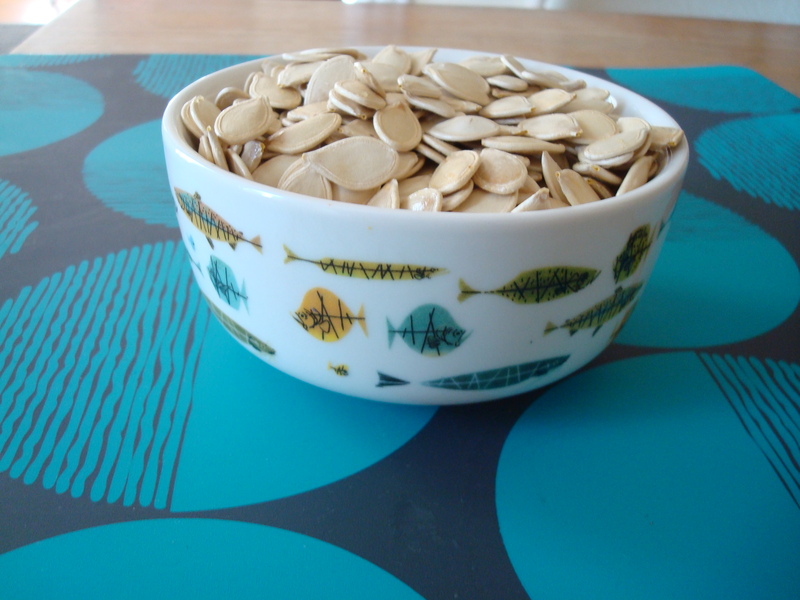 Place all the seeds into a bowl (you can roast them later and make pepitas—see recipe below). Repeat until all the pumpkin pieces are largely free of seeds and pulp. Place pumpkin pieces on a baking sheet (face up or face down, does not matter) and roast in a 350-degree oven for 45 minutes, or until pumpkin is fork-tender. They should be nice and light golden brown when done. Peel off the skin from the pumpkin pieces until you have a big pile of the stuff. If you have a food processor, throw in a few chunks at a time. A blender will work, too, if you add a little water. Or you can simply mash it up with a potato masher, or move it through a potato ricer, or process it through a food mill. Or you can use an immersion blender if you have one of those. 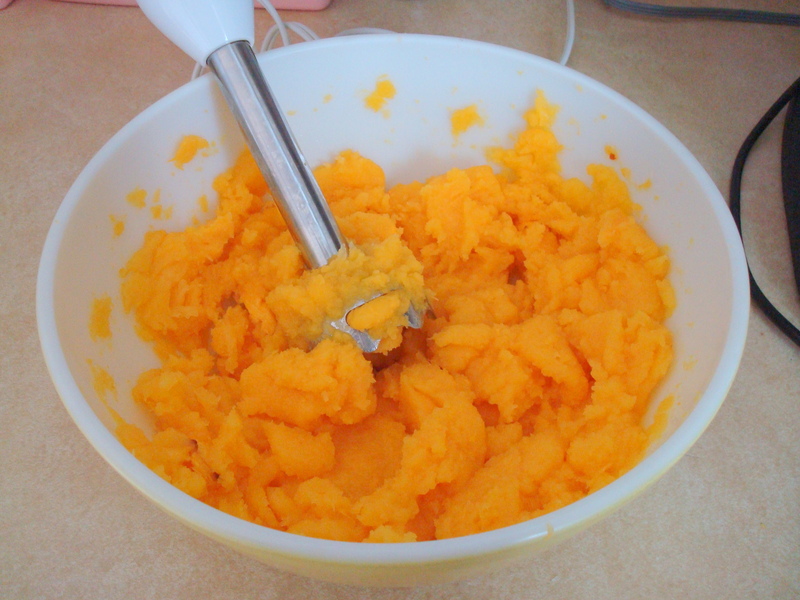 Dump the pureed goodness into a bowl, and continue pureeing until all the pumpkin is done. You can either use this immediately in whatever pumpkin recipe you’d like, store it in the freezer for later use. 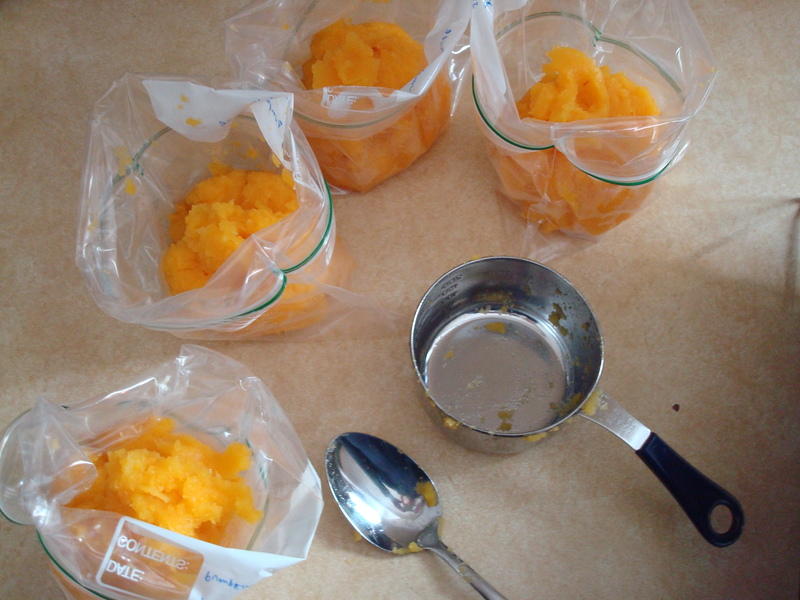 To store in the freezer, spoon about 1 cupful of pumpkin into each plastic storage bag. Seal the bag with just a tiny bit of an opening remaining, then use your hands to flatten out the pumpkin inside the bag and push out the air. Store them in the freezer until you need them. 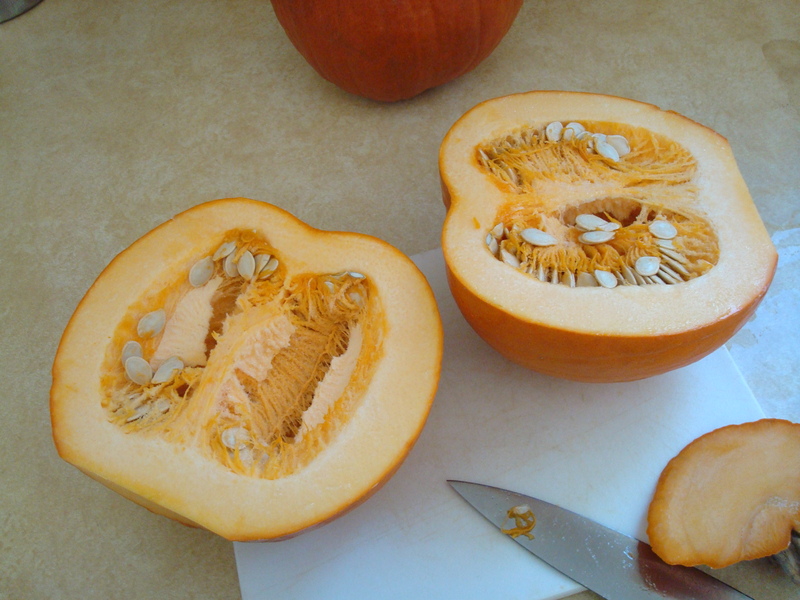 As you gut the pumpkins, keep all the seeds—and guts—in a bowl. Throw them into a colander and rinse them under cold water, pulling away the chunks of pulp as you go. 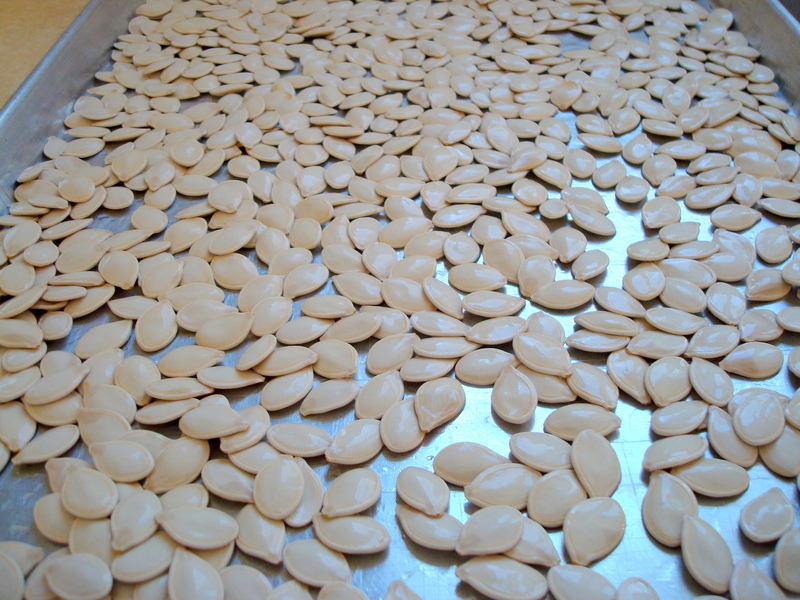 Spread the rinsed seeds out on a baking sheet and allow the seeds to dry several hours or overnight. And beware: they’re quite sticky/slimy, so don’t place them on paper towels! Just leave them on the baking sheet and they’ll be fine. When they’re dry preheat the oven to 250 degrees. Drizzle the seeds with a couple teaspoons of olive oil. Use your fingers to toss the seeds around to coat. Then salt and season the seeds to taste. Bake them for an hour or so, until the seeds are light golden brown. Pepitas need to be stored in an airtight container if they last beyond the first day. When I was new to Thai food I was a Pad Thai girl all the way. Pad Thai seems to be the gateway food for many who are new to Thai cuisine, though I eventually did venture away from the noodle dish and experimented with Massaman curry and satay and various peanut-based curries. Lately I’ve been really into Penang curry. I’m not so well-versed in Thai food as to be able to tell you what makes Penang curry different from other curries, I just know that I like it and also that a local Asian grocer conveniently carries Penang curry paste. Score. 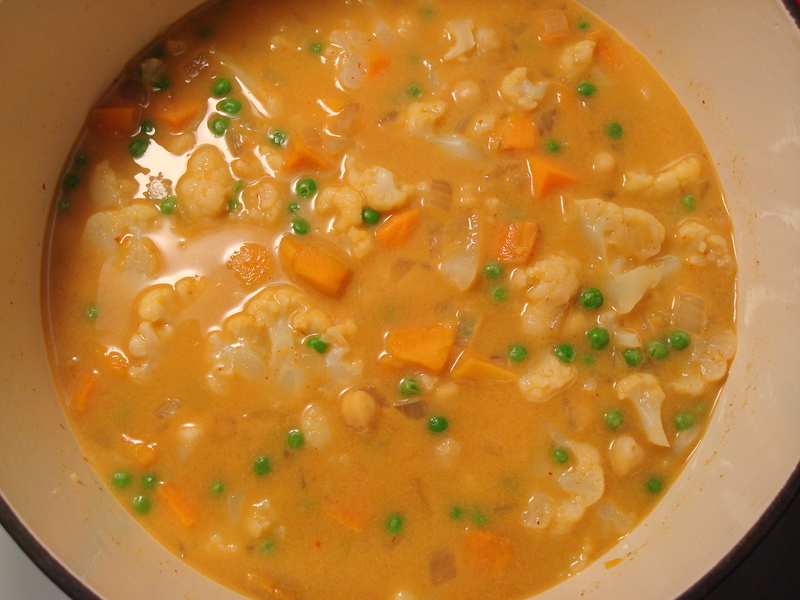 I found a recipe for a simple vegetable curry to use as a guide and went from there. 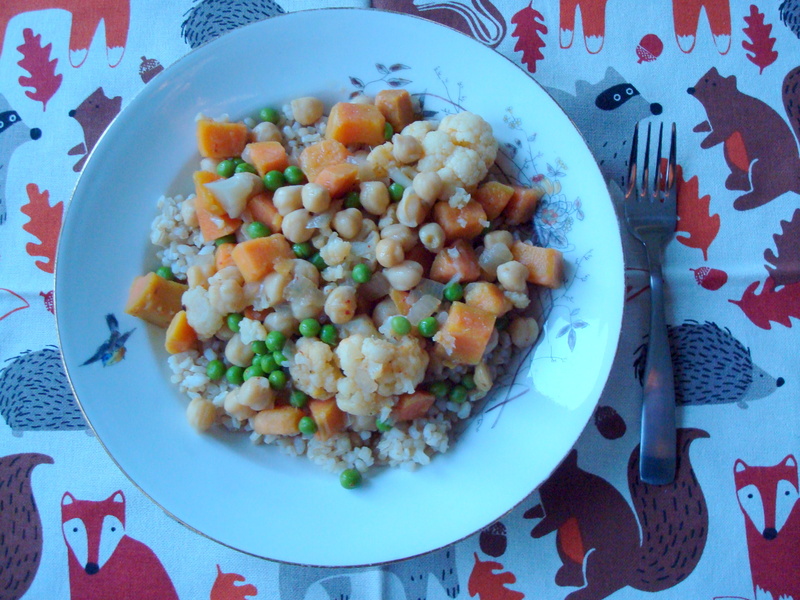 The recipe called for sweet potatoes (love), cauliflower, and chickpeas (which I had cooked up myself from dried beans and stored in my freezer for later use a few months back). I wanted to add a little more color to the curry so threw some frozen peas into the mix. A little tip that I sort of feel like a genius for thinking up, though by no means do I think that I am the first one to have this thought: the recipe called for coconut milk and a cup of water so I emptied my can of coconut milk and then filled the can up with water and added that to the pot. It made broth richer by getting a little more coconut milk in there and also cleaned out the can for recycling at the same time: two birds, one stone. So simple, and yet I’d never thought to do this before. The resulting curry tasted pretty much exactly like the Penang curry I often get at a local Thai restaurant so on nights I don’t feel like making the half hour drive for carry-out I can recreate it myself at home. It would be especially excellent with a little Thai iced tea. 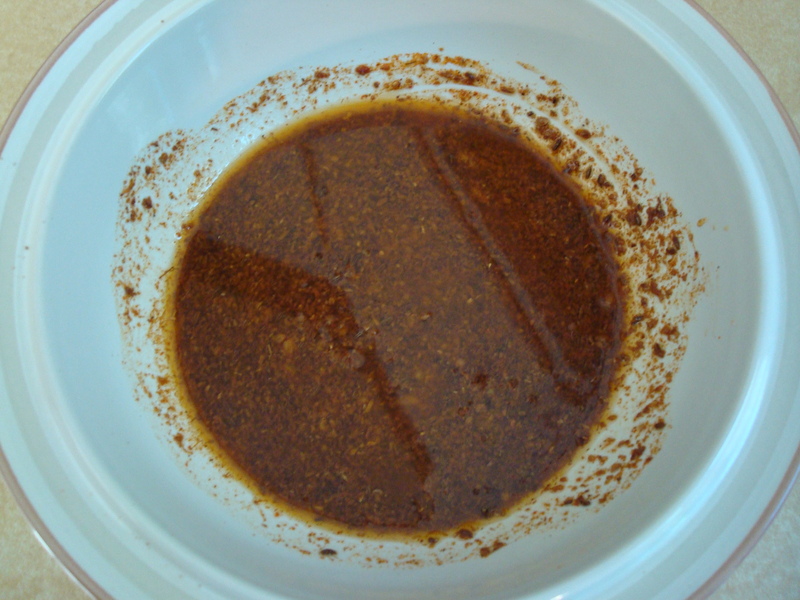 In a large Dutch oven or heavy pot, heat oil over medium-high heat. Add onion and cook, stirring often, until soft, 3 minutes. Add curry paste and stir until fragrant, about 1 minute. Stir in coconut milk and 1 cup water and bring to a boil. 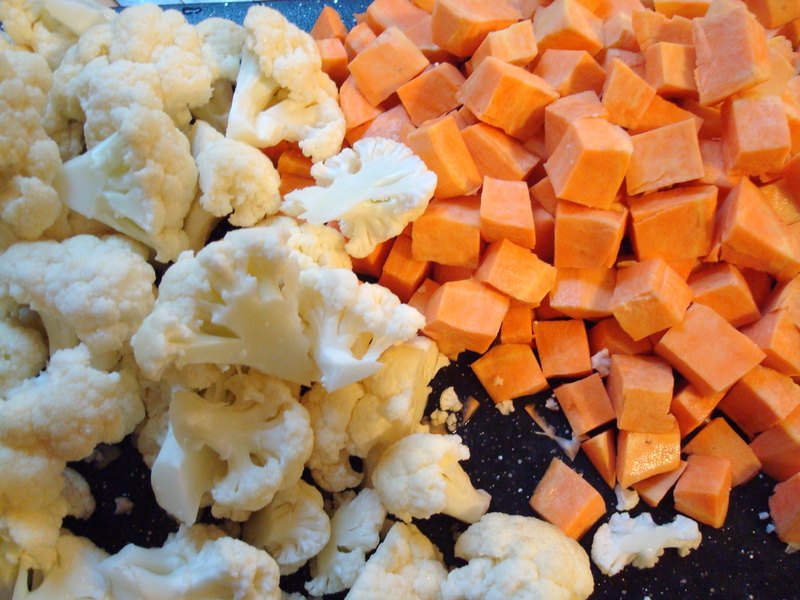 Add sweet potato and cauliflower and season with salt and pepper. 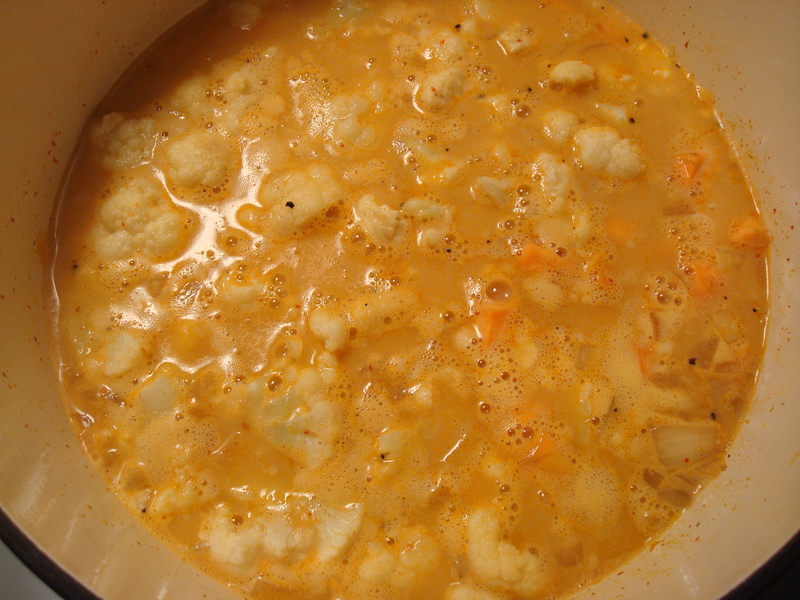 Reduce heat to medium, cover, and simmer until vegetables are tender, 10 to 15 minutes. 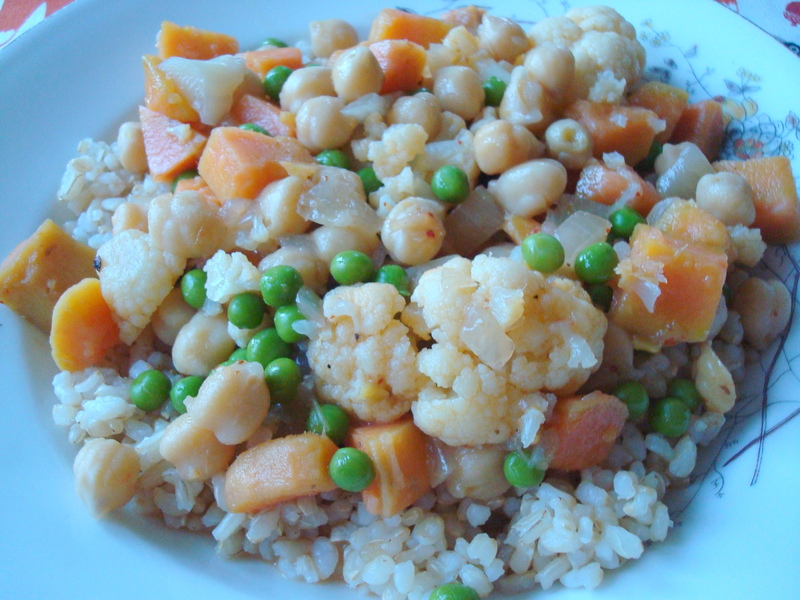 Stir chickpeas into curry and increase heat to high. Simmer rapidly until liquid reduces slightly, 2 minutes. Serve curry over rice. This is going to feel like a cheat post and it kind of is. There are only two photos and the recipe is one that I have memorized I make it so much. I’m not sure if there even was a recipe originally, but I suppose those are the best kind. Much like kale chips I make these when I feel like I want healthy versions of junk food. Which is often. 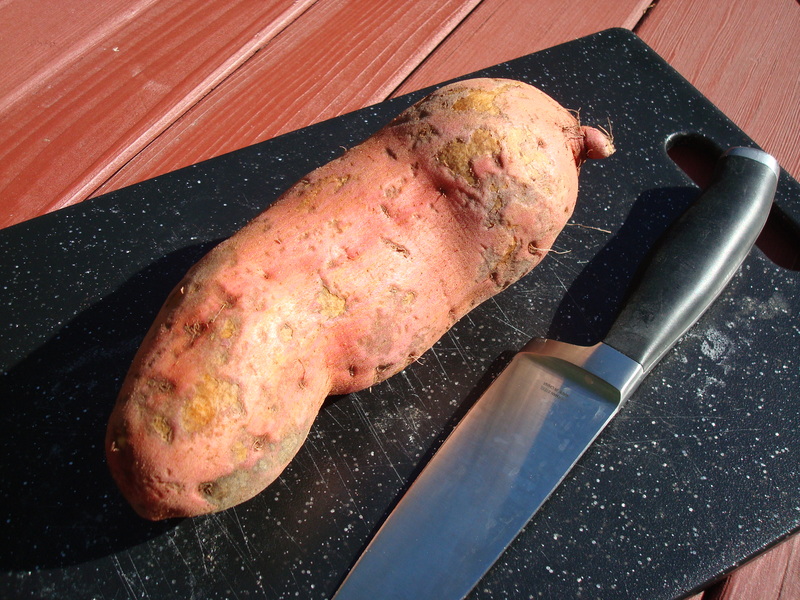 I like to peel my sweet potatoes but you could certainly leave the peels on yours if you’re into that. I toss the peeled sliced sweet potato chunks with olive oil, salt, pepper, and cumin, though you could shake it up and change out the cumin for curry powder and that would be awesome too. Shake it up a bit. These fries are healthy because they aren’t actually fried, they’re baked. Genius. Sometimes I eat them with honey, sometimes with ketchup, and sometimes plain– just depends on what kind of mood I’m in. You could even get fancy and whip up an aioli to serve them with. Go forth and enjoy! 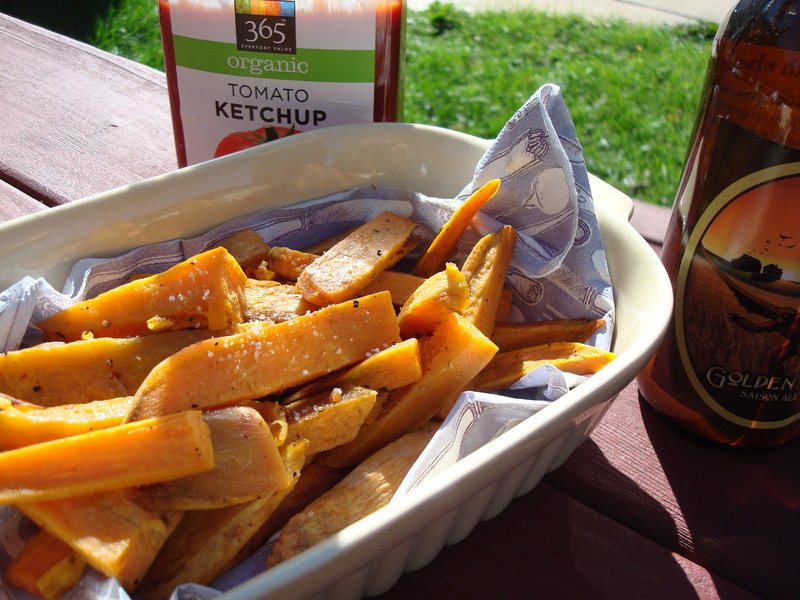 Preheat oven to 425 degrees F. Toss sweet potato fries with a little olive oil until lightly coated. Sprinkle fries with salt, pepper, and cumin or curry. Bake for 30 minutes, shaking pan several times to bake fries evenly. Serve with ketchup or honey, if desired. I’m ashamed to say that I once shied away from beets. Their strange texture, earthy smell, and vibrant color used to totally freak me out. I’m very glad to say I got over that and realized how wonderful they are and now grate them raw into salads and juice them on a regular basis. A coworker of mine makes the most excellent pickled beets that someday I plan to learn how to replicate. But today we roast them. A friend of mine teases me because I like everything roasted. Almonds, flax seeds, sweet potatoes, garlic. The list goes on. 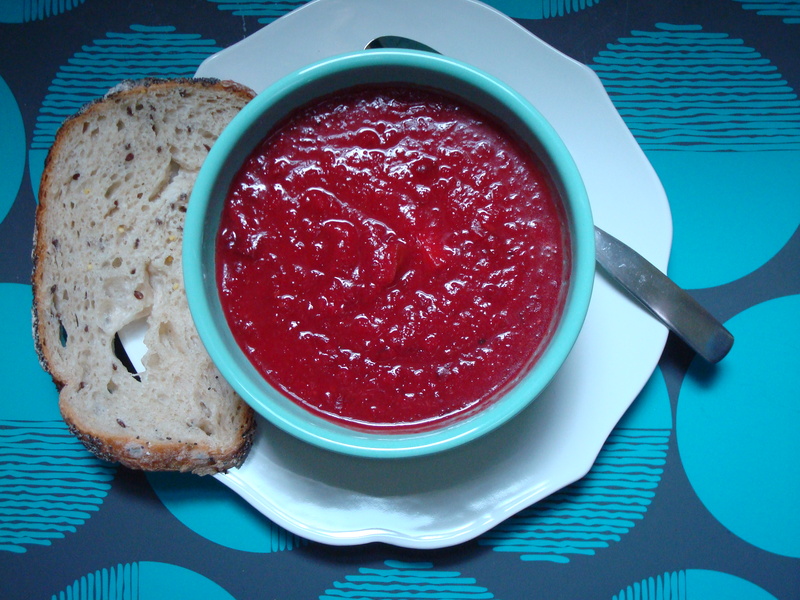 So when I found a recipe for roasted beet and potato borscht I was totally intrigued. Borscht is a beet-based soup and it has been something I have always been curious about but never wanted to try because I wasn’t sure I could eat a whole bowl of soup dedicated to the boldly-colored, earthy-smelling vegetable. 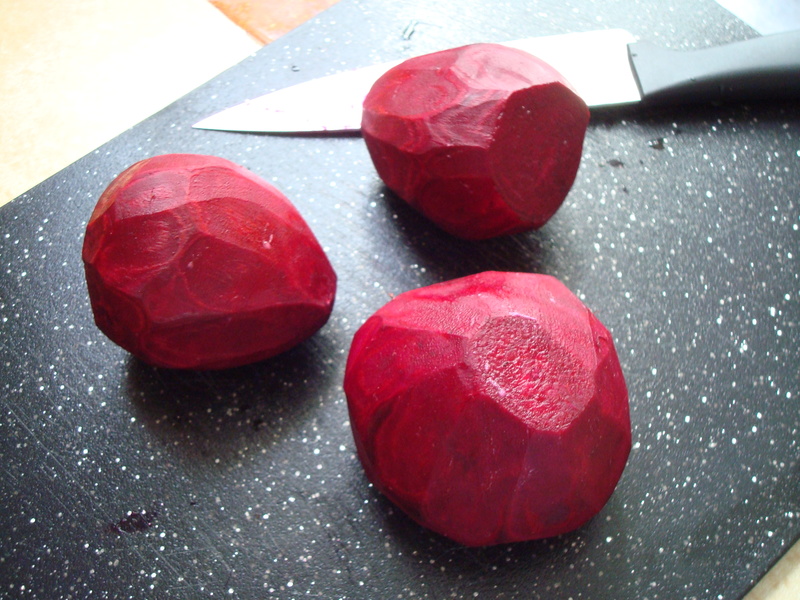 If the beet were first roasted, however, I think it could be a thing of beauty. The recipe couldn’t be simpler: you peel and chop up some beets and potatoes and throw them in with chopped shallots (I didn’t have any on hand so used a yellow onion which worked out just fine) into a roasting pan, toss with olive oil, salt, and freshly ground black pepper and then add a couple of twigs of thyme and roast them all in the oven for about 45 minutes. Once the roasting is done, discard the thyme, and add the vegetables to a large pot with 5 cups of chicken broth or water and bring to a simmer. Then you mash the vegetables with the back of a wooden spoon or potato masher or use an immersion blender and voila. Add a splash of red wine vinegar and top with sour cream and scallions or parsley if you so desire. I skipped the toppings and it was delicious. Roasting is the way forward. Preheat oven to 400 degrees. In a roasting pan or rimmed baking sheet, toss together beets, potatoes, shallots, thyme, and olive oil; season with salt and pepper. 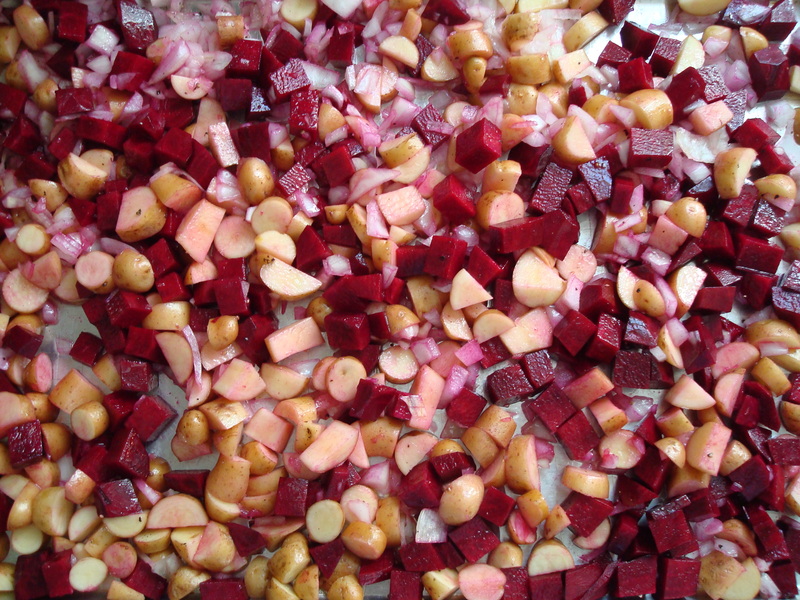 Arrange in a single layer and roast until beets and potatoes are cooked through, about 45 minutes. 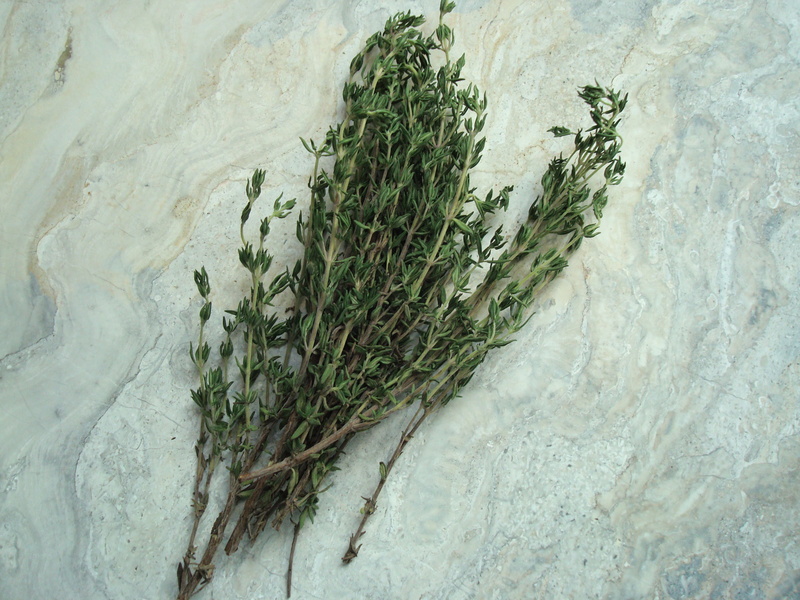 Discard thyme. Add vegetables to a medium pot, along with broth. Bring to a simmer over medium-high. With a potato masher or back of a wooden spoon, mash some vegetables until soup is thick and chunky. (I made quick work of it by using my immersion blender.) Stir in vinegar and season to taste with salt and pepper. To serve, top with sour cream, parsley, and scallion greens, if desired. Normally, I’m a list person. I don’t go anywhere without a list, especially not to a place that almost requires a list like a grocery store. That would be like leaving the house without my cellphone. You know what I mean. Leaving your house without your cellphone is the new leaving your house without clothes on. You feel vulnerable and lost without it these days. So Saturday morning I did something radical: I threw caution to the wind and decided to go to the farmer’s market sans list. It was wild. I wound up picking up a few predictable things: raspberries, green beans, kale, but also came home with a few surprises: namely, okra. I have eaten it in restaurants before but if the farmer’s had not labeled the okra in their stands I would not have recognized it in its whole form. But what the heck, I could find something great to do with it. 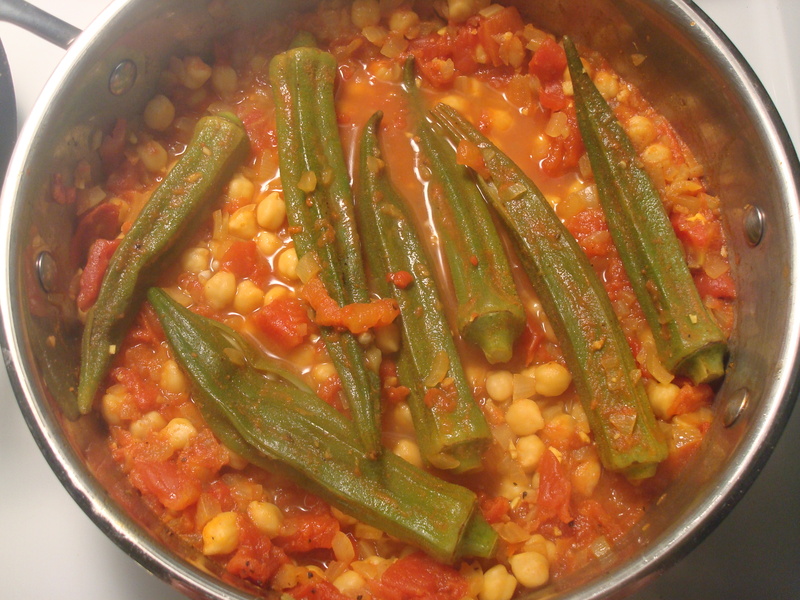 I did a little research on my iPhone and the first recipe I came across was the one I decided to go for: curried okra with chickpeas and tomatoes. This was perfect because a) I love curry, and b) I had both chickpeas and a can of tomatoes that needed to be used up in my pantry. One thing that I wish I had known beforehand was that it is better to buy small okra. My greedy eyes thought that bigger would be better so I bought okra that was 5 to 6 inches in length when apparently 2 to 3 inches is better. I definitely could have fit more okra into my pot if they weren’t so big. But nevermind, they still tasted great and I’m totally psyched about cooking with okra again in the future. Sometimes it’s a very good thing to leave your lists at home! 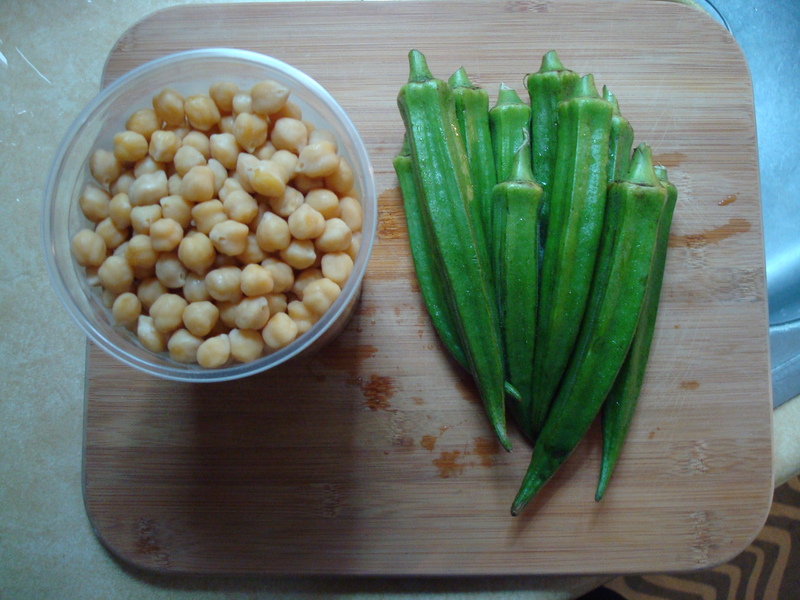 If using fresh okra, trim, leaving tops intact, being careful not to cut into pods. Heat oil in a 12-inch heavy skillet over moderately high heat until hot but not smoking, then sauté onion and garlic with ginger and curry powder, stirring, 2 minutes. 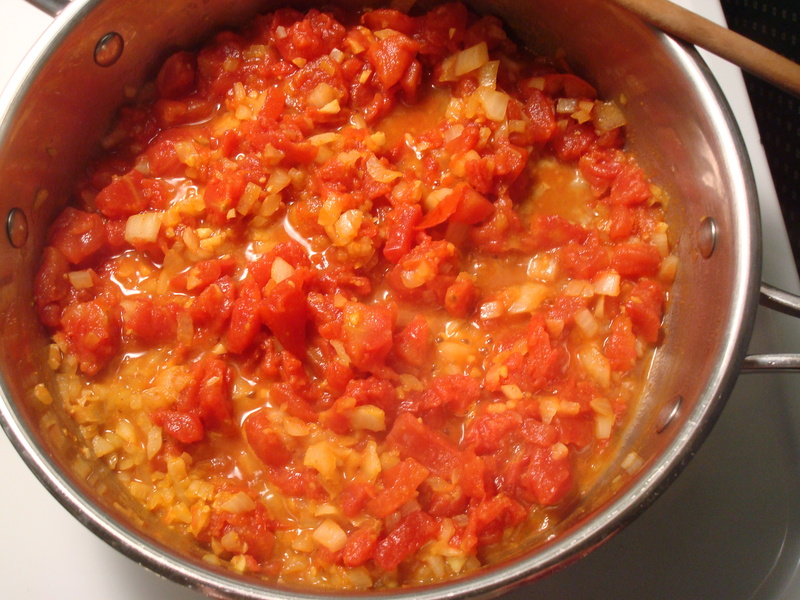 Add tomatoes with their juice, chickpeas, and water and boil, uncovered, stirring occasionally, 3 minutes. Stir in okra, salt, and pepper and simmer, covered, stirring occasionally, until okra is tender, about 10 minutes. Serve over rice or quinoa.